And then, going even further back.... *blush! 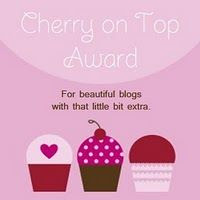 * furrypig kindly passed on to me a blog award while I was on holiday. Since then, as I've failed to actually get it onto my blog, several other people have also passed it on to me! Thank you, then, to furrypig, and also to Sandi, to Deb and (again) to Abi :-) Please don't think that the delay in mentioning this award in any way reflects a lack of gratitude, as I am so touched, humbled and happy that you picked me! I'm hoping to get a new camera soon!! (Woo hoo!!) We need to replace and upgrade the point and shoot; I'm looking into digital SLR options!! (Woo hoo!!) Not sure when it'll be (we need to save up after the holiday) but definitely by Christmas, I think. I hope!! A lovely photo and cute prizes! What good friends The Children appear to be! Well done on the prizes...those Bo Bunny papers are definately scrummy....and what a gorgeous,giggly pic of The Children. Ah, Mise, you have hit the proverbial nail upon its proverbial head :-) The Children APPEAR to be good friends.... As I type this, they are engaged in trying to push each other down the stairs. Maybe that's why I like the photo? I can pretend that all is calm and peaceful? that is totally cute! exciting blog wins!! Looking forward to seeing what you make out of those lovely prizes - lucky girl! And I am so with you on the disliking feet front. I hate feet, mine or anyone elses! Could not be a pedicurist, reflexologist or chiropodist for all the tea in China. My husband thinks I'm weird - but now I have someone else on my side! Wow, what great prizes! I was lucky enough to win some prizes recently too... two Shimelle courses, with extra places for friends! Also, by co-incidence, I won some goodies from Shimelle during her scrapping weekend recently. I'm eagerly awaiting the postlady every day now... hoping she'll have my little package of Imaginisce goodies. Oooo!! I am with you on the feet. I'm not so keen either. Mine are not great - rather ruined by too many years of ballet classes. One toe bends over so much that a friend once commented "But you don't have a nail on that toe!" I do, it's just hiding :-( Still, I wear sandals - I never did aspire to be a super-model anyway! the Children look happy in that photo. 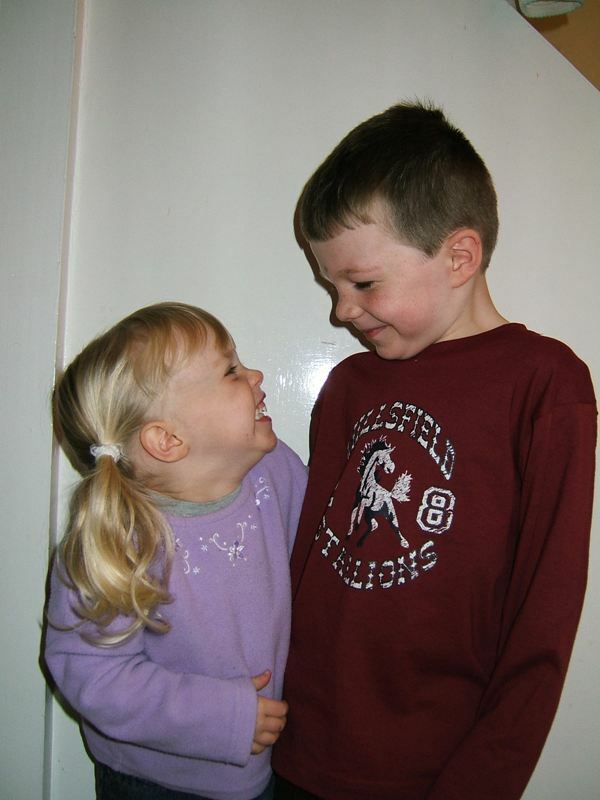 I love it too - I always love shots of happy children. It is my own belief that it is never too late to say thank you (or I'm sorry)... and thus, you are not overdue. :) Congrats on all those goodies! Gorgeous photo of your 2! And haven't you done well ~ fabulous amount of yummy-looking stash!